Young design talents from universities in the Czech Republic, Italy and Kenya will come together in the Czech Republic at Bata Fashion Weekend 2019, held at Prague’s historic Zofin Palace on 12-14 April, to find out who has won the Bata Young Designers’ Challenge 2019. Asked to create a design-proposal sneaker, around the theme of "The Evolution of Style", the winning shoes will be put into limited production and sold at selected Bata stores globally. 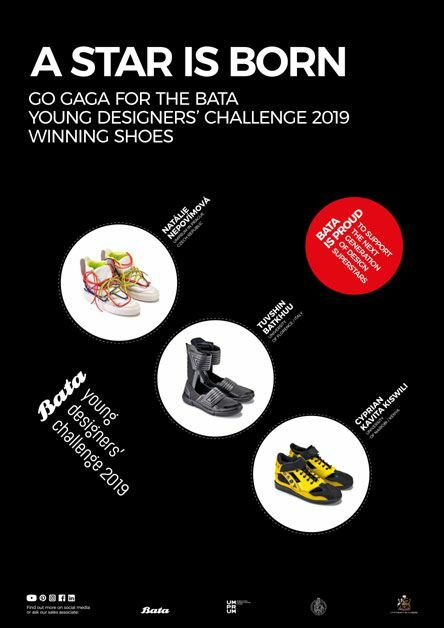 Ten students from universities in the Czech Republic, Italy and Kenya will soon discover who has won the coveted Bata Young Designers’ Challenge 2019 contest. Established by Bata in 2017 as a way for the fashion footwear brand to support and help exciting young design talents, the winners are set to be named on 13 April 2019 at the annual Bata Fashion Weekend, this year being held at the historic Zofin Palace in Prague. The format of the competition saw scores of design students from three universities – the Academy of Arts, Architecture and Design in Prague, Czech Republic; the University of Florence, Italy; and Nairobi University, Kenya – present prototype shoe designs to the jury, with selected students from each university going through to the next round. These chosen students were invited to actually produce their designs at Bata factories in the Czech Republic and Kenya, under the watchful eye of dedicated and experienced shoemakers. These are the shoes that will be on the catwalk at the Bata Fashion Weekend and voted on by a panel of judges, comprising of members of the fashion media, established fashion designers and Bata representatives, including CEO Alexis Nasard; Jana Barbati Chadova, Head of Global Marketing; and Barbara Franceschetto, Group Product Director. One winner from each of the three participating countries will be announced, with the winning shoes being put into production and sold in selected Bata stores around the world. The public can attend Bata Fashion Weekend 2019, free of charge, and see the finale of the Bata Young Designers’ Challenge 2019, as well as enjoy all the festivities as Bata celebrates its 125th anniversary. The theme of this year’s contest was ‘The Evolution of Style’ and students were asked to produce sneaker. Brief biographies on the students, as well as their design inspirations, is given below. Aleš finds inspiration in fine art, objects, sculpture and photography. He tries to combine fashion with art and believes that fashion and art are equal. Though he now studies at UMPRUM, he previously studied Shoe Design in Uherské Hradiště. His main inspiration came from work boots. The pattern of the shoe is minimal, and the final shape is formed by a strap that is turned around the leg. The shoe is made from black leather combined with textile, though the whole shoe could be produced entirely in leather. Alexandra was always interested in fashion and footwear design but, because she is from a small town in the north of Slovakia, there were few opportunities for creativity. To combat this, Alexandra and her mother started working on projects together and it is her mother who introduced Alexandra to art and design. Alexandra then went to the School of Applied Art in Ružomberok where she gained technical experience and began working on her own fashion collections. Much of her work is inspired by vintage circuses, which she loves. Interested in new concepts of art, design, culture and ethics, Natálie experiments with crossing the boundaries between fashion, design and fine art. Her work is a narrative of expression through dress, clothes and shoes, through to a human. She believes in sustainable, timeless design which possess a multifunctional dimension and aesthetic flexibility. This shoe is a deconstruction of a typical sneaker, but with component parts traditionally used in utility boots, such as a padded ankle support, massive tongue, and lacing. She has incorporated metal rings for variable lacing, and this is where the functional lacing becomes an aesthetic art element. These sneakers are made of luxury leather with metal rings, and a contrasting neon yellow textile lining, sitting on top of a typical white tennis outsole. Tomáš wanted to be a fashion designer since he was small and previously studied Footwear Design at the School of Applied Art in Uherské Hradiště before joining UMPRUM. He describes his clothing designs as conceptual and on the edge of fashion art, but with shoes he takes a more experimental approach. Using black leather, these shoes were inspired by a photographic series by Thierry Urbain, particularly the way Urbain plays with light, shadow and depth, the archival look his photographs have, and the geometric shapes of the architecture he was taking pictures of. Originally from El Salvador, Adriana is an industrial designer, as well as a linguist. Her native language is Spanish, she is fluent in English and, since she started her studies in Italy in 2014, she now counts Italian as her third language. Because Bata is celebrating its 125th anniversary, Adriana wanted to take something for her inspiration which represented the past and the future, and so came up with a compass, the icon used on GPS location services. She used black and white, creating a futuristic sneaker that represents the growth of Bata, transmitting the idea that Bata follows your steps everywhere you go. Practical, this sneaker can be worn throughout the day, but is chic enough to be worn in the evening and with any outfit. After graduating with a bachelor’s degree in Industrial Design from Florence University, Elisabetta realised that fashion is her real passion. Why? Because she loves the challenge of creating something that is not only beautiful and functional, but also something which involves and excites people. Keen to create an emotional link with the wearer, personalisation of the product is a key element in ‘Crush’. The shoe has a minimal look, characterised by the contrast between black and white, and the use of a treated leather, giving a cracked or crumpled surface (which inspired the name ‘Crush’). The numerous metal accessories give a rock aesthetic to the product and allows the customer to personalise the shoes with different accessories. Leonardo has a lifelong love of art and craft, spending his early years painting and building objects, toys and furniture. He studied Industrial Product Design in Bologna, using laser cutting and 3D printing to build things such things as scale models for architecture students, before graduating in March 2018. He then moved to Florence to begin his Master’s degree in Fashion System Design. Inspired by movement and resourcefulness, OpOp is designed to be comfortable and fast to wear. Starting with the concept of a running shoe without laces, an Op Art decorated ribbon holds the foot firmly in place – the wearer simply pulls the rear eyelet to tighten the ribbon. With a minimal Lycra upper, the Op Art fantasy ribbon really stands out. Designed to be versatile and for any situation, the shoe also comes with plain black ribbons, meaning the wearer can choose to enrich a formal outfit with an artistic touch, or to go with an all-black outfit by changing the ribbon. Tuvshin describes himself as a young artist with poor talent, or a creative person with some creative behaviour. He has been drawing and designing since early childhood and, after graduating from the Institute of Fine Arts in his native Mongolia, he moved to Florence to continue his artistic journey. He continues to paint and design and considers himself an overthinker who turns his thoughts into art. Rejecting excesses and kitsch, minimalism was the driving inspiration behind this shoe. The main concept is to show the beauty of simplicity. The idea and aesthetics of a minimal design are close to the designer’s heart, and the colour black was chosen to represent strength, power and purity. Though Anita focusses on interior design and dreams of becoming an influential interior designer, she is clearly capable of producing eye-caching shoes too. Full of creativity and imagination, she finds inspiration from the colours and patterns found in nature. She says these colours and patterns are also reflected in her personality, which is joyful, happy and easy-going. The inspiration for these shoes came from a walk in the savanna, specifically from the Swahili culture from the Kenyan coast. Swahili are known for spicy foods, curvy architectural designs, and detailed patterns on their jewellery, instruments, clothes, weapons and furniture. She took these elements and incorporated them into the type of sandal she wore as a toddler, mixing the sandal with elements of a traditional derby shoe. The aim was to create a shoe that is comfortable, affordable, unique and can be worn globally. Swahili elements, in the shape of the tamarind fruit, can be seen on the Velcro. Born in Machakos, Kenya, Cyprian Kiswili is at the University of Nairobi, School of Arts and Design, majoring in Illustration. He works predominantly in the medium of painting and digital illustration. Cyprian aims to depict beauty and sophistication through a combination of colour, texture and shape. His project ‘Blossom’ draws rich inspiration from the cheerfulness, playfulness and fullness of the bushy Savannah land. The vast, bushy savannah on the edge of the town Konzo was the inspiration for Blossom, specifically the blossoming flowers, the chirping birds, and the lively people and insects. The shoe is also heavily inspired by illustrations and cartoons. This shoe creates a striking balance between fun and seriousness, taking symbols and icons and expressing them in the form of fashion. Bata’s most iconic shoes over its 125-year history are also heavily referenced here, most notable of which is the classic North Star.